As preparation for the 2019 race season is well underway for most race teams, the excitement of a fresh start accompanied with the ever-changing state of drag racing has the motorsports world buzzing. The stage for sportsman drag racing is set to be bigger than ever with growing car counts and unprecedented purses at premier events from coast to coast—a constant progression that is driving our sport to new levels of competition and changing lives one payday at a time. The rapid progression of sportsman drag racing requires a similar progression that as racers we all must evolve with. To say that my own program has undergone sweeping changes for the 2019 season is an understatement–but as I see things, if you’re not doing your best to get ahead you’re probably falling behind. As part of the new blog team here at Drag Champ, I am proud to say that I represent some of the progression in sportsman drag racing. When given the offer to share my perspective on the racing world in the form of a monthly blog I saw an opportunity I couldn’t pass up, and so here I am. For the racers and readers that aren’t familiar with my background, I’d like to devote this first entry to telling you more about the racing history that shaped me as a person and as a racecar driver. To get the formalities out of the way, my name is Kris Whitfield, age 29, born and raised in Littleton, Colorado (just a few miles west of Denver in the foothills of the Rocky Mountains). Born into a “racing family”, and like many of you reading this, my entire life has been spent going to and from racetracks in the western region of the United States. It’s all true, with pictures to prove it. My dad, with the help of Colorado Motorsports Hall of Famer Junior Kaiser built my dad’s first racecar from a first-generation Camaro that was abandoned in a lake. With a background in welding, there was an easy progression for my dad to turn to building racecars and it didn’t long to start making a living from it. In the early 90’s, under the name Pro Toys, a shop that started out with simple tubs and roll-cages evolved into one of the first shops in Colorado to offer ground-up racecar fabrication. Many of the cars that were built by Pro Toys are competitive cars to this day. I have memories as young kid spending hours in the shop cruising in my fire engine peddle car while my dad welded racecars into existence. In 1997 my dad sold the shop to business partner and current owner/operator Shawn Kennedy, who now operates under the name Kennedy Race Cars Inc. in the original location of Pro Toys. Though no longer a racecar fabricator by trade, there was never a lapse in my dad’s commitment to drag racing. He took me on my first racing road trip to Amarillo, Texas when I was 3 weeks old, bought me a junior dragster at 8, and I had my first and current Super Gas roadster at 18. Along with his Super Comp dragster I’ve added my own dragster, and we get to spend summers traveling the country and chasing our dreams. Since we are blessed to be able to travel and experience different parts of the country we often see amazing things and meet some amazing people. It’s my hope that through these blogs I can introduce readers to some of the places and people they may otherwise not know much about. Here’s to a fast and fun 2019 race season! About the Author: Born and raised in Colorado, Kris Whitfield began racing juniors at age 8 and currently pilots a 2004 Undercover dragster and a ’27 T Super Gas roadster. He has 16 track championships as well as 2 NHRA national event wins. 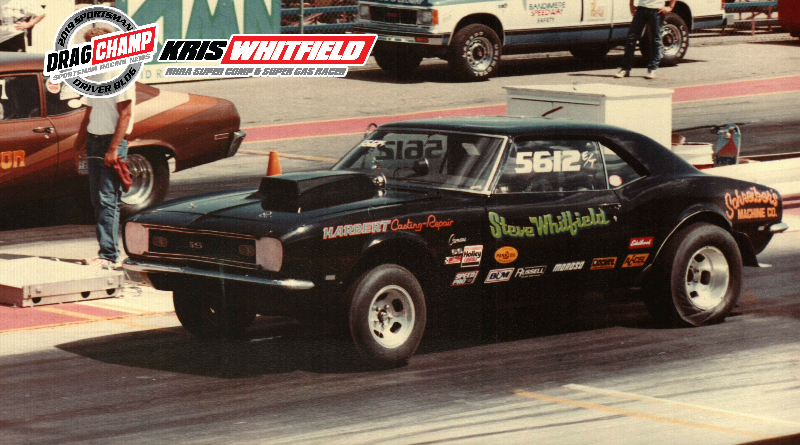 With seven years experience working race-operations at Bandimere Speedway and with a life spent in the sportsman pits, Kris offers DragChamp readers a unique and relatable perspective. For the 2019 season, Kris will represent sponsors Go Fast Energy, Phantom Racing Graphics, DJ Safety, DMP Awnings, Nationwide Productions, Armed Forces Racing, NGK, Precision Specialties, Premier Diversified Insurance, and This is Bracket Racing Elite. For more DragChamp racer blogs, click here.